40 n Performance & Hotrod Business n February 2015 PERFORMANCE If you choose to paint, surfaces must be clean and dry, (that should be obvious). 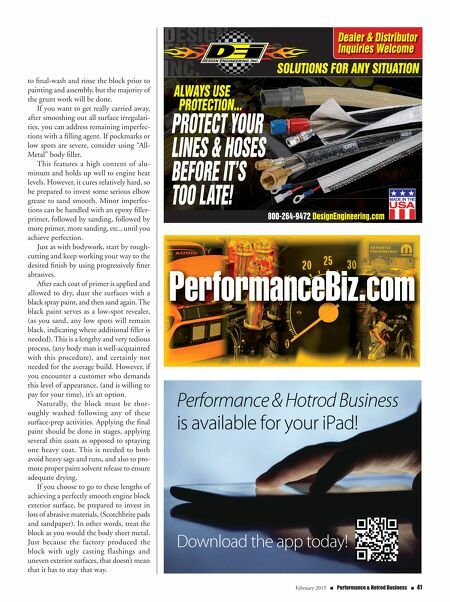 Prior to applying the paint, consider applying a thin coat of a quality etching primer. This will seal the surfaces to prevent surface oxidation, (which buys you a bit of time if you are not able to apply final paint the same day). An etching primer also bites into the metal surfaces, providing a much more durable adhesion. Stay away from bargain primers that claim to have surface-etching capabilities. The only etching primer that I've used that actually works is offered by SEM, (this stuff will actually etch into glass). It's expensive, but worth it. It's best to allow the etching primer to cure for about eight hours or more before applying the final paint. Block Surface Finish If you really want to get carried away in terms of appearance, you can take the time to smooth-out all surface irregularities from the block, (casting flashings, dimples, high spots, etc. ), which will take hours, (if not days), using a die grinder with cutting bits and abrasive pads. If the engine is to be built, (let's assume that the engine is disas- sembled and the block is to be machined, crank balanced, etc. ), and you want to detail the exterior surfaces, perform all of your surface prep before the block goes to the machine shop. By performing all surface grinding, filling, sanding, etc., before the block is machined, you won't be faced with contaminating the bores, oil and coolant passages once the machining has been accomplished. You'll still need If you intend to paint more than just the block, after applying an initial color basecoat to separate components, (block, heads, oil pan, etc. ), loosely assemble and apply remaining color. This can help provide a more uniform appearance, especially if the paint contains any metallics. Here the heads were temporarily mounted to the block with short standoffs so that they would not stick to the block decks as paint is applied. A spare timing cover was installed here simply as a mask. Mounting the block to a rotating stand allows easier access to all nooks and cran- nies to ensure that no areas are left uncoated. Why not paint the oil filter to match? If this appeals to you, plan to paint a batch (perhaps six or so) oil filters so that the customer will have pre-painted spares for future oil changes. Be sure to carefully mask off the filter's cavity port. 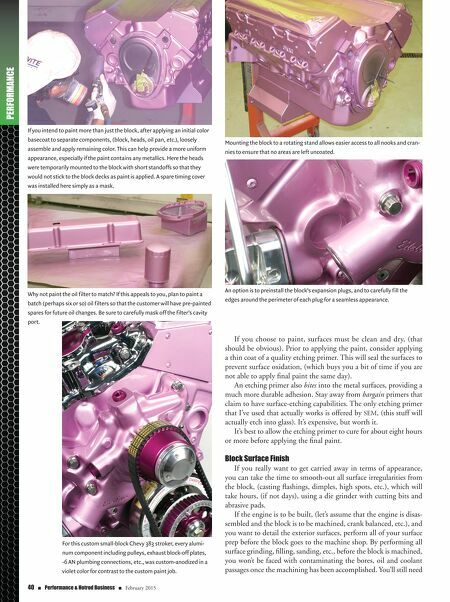 For this custom small-block Chevy 383 stroker, every alumi- num component including pulleys, exhaust block-off plates, -6 AN plumbing connections, etc., was custom-anodized in a violet color for contrast to the custom paint job. An option is to preinstall the block's expansion plugs, and to carefully fill the edges around the perimeter of each plug for a seamless appearance.